Animal collaging for kid’s rooms | Hey Bernice! 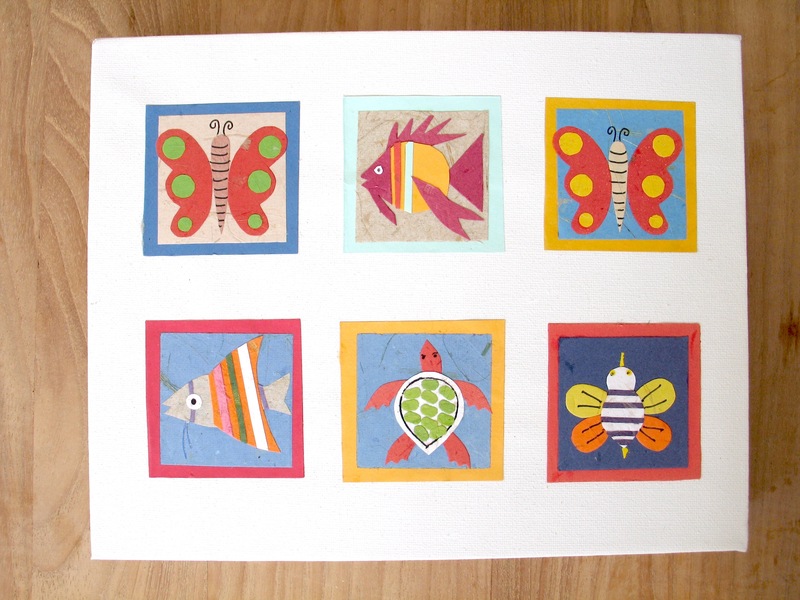 A recent present I made for a great friend (for her new little boy) was a version of these collage animals. I cannot take the credit for ‘creating’ the collage animal designs that I have used – I found these in a shop in Port Douglas 6 months earlier. Whilst on holiday I was ferreting in one of those incense burning, crystal shops and saw a bowl of these tiny hand-made cards with different collage animals on the front. To the surprise of the shop assistant, I purchased about 30 of these cards (they were as cheap as chips!). I had no idea what I was going to do with them, but knew I had to squirrel them away for future use have them! Try to picture the conversation I later had with my husband attempting to explain why I had to add to the hord of things sitting untouched at home buy 30 cards for a reason I have not yet established … needless to say, he is getting used to this behaviour (he has recently witnessed a spate of creative endeavours that have utilised many items from my crafty archive – however not at the same rate that I am accumulating). So, back to nursery decorations. I proceeded to cut the back off the cards and then went about arranging them on small canvases (as pictured), and also did one within a picture frame (a bit more formal). When I ran out of animals, I used the coloured card from the back of the cards to cut up and create more of my own animals. I love the colours, and the simplistic animal structure. Some coloured card (not too thin or it will bubble when you glue the pieces onto each other, and firmer card is easier to manage. A canvas or picture frame to arrange them on/in. There is no right or wrong, it is simply cutting pieces of paper and sticking them on top of each other to make it look vaguely like an animal. If your kids are older than newborn, this could be an enjoyable activity for them to do themselves!